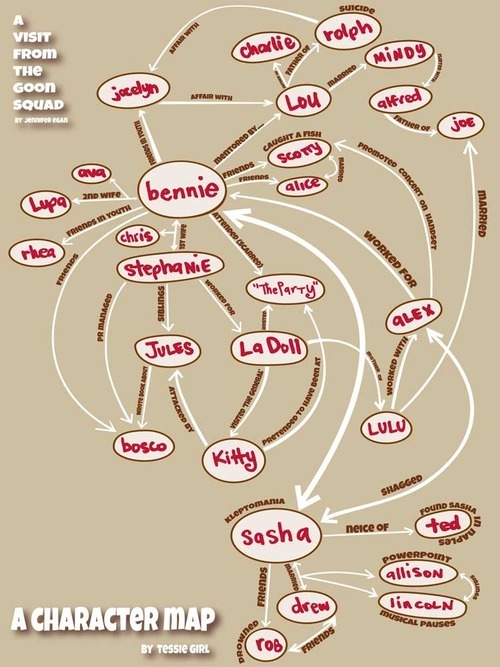 I resisted posting this image of the interconnection of characters – and chapters – from Jennifer Eagn’s *A Visit From the Goon Squad* because part of what makes the book SO GOOD is its use of form – chapters narrated by different characters, at different points in time, who are all, loosely connected to one another through this odd web – to mirror how we (or me, at least) experience social life and memory. My experience of friendship, family and connection is one of loose recollection that ‘oh yes, I was at a party with so-and-so once’ or ‘I remember you from where exactly?’ but also that there are people who weave in and out of our lives with varying degrees of impact – some who spend short periods and leave (as they say) lasting impressions. And so I don’t want this image because it makes it easier to remember who everyone is and how they are connected than they have any right to be: our memory of these characters *should be* scattered and fragmented and pieced together with glimmers, because that’s how we go about remember people (again, I might be speaking for my own failing memory here). So too the brilliance of the passage of time in these layered and asynchronous chapters. Midway through the first chapter I had a horrifying thought that perhaps I had started reading a short story collection (the record is quite clear on how I feel about short stories) because the plotting was so dense, the characters so rich and the evocative images, well, evocative. When I realized in the second chapter that no, perhaps these were *linked* short stories, and then as the thematic resonances and character repetitions continued I decided that I was, in fact, reading a novel, what became clear – through the muddy plot and disappearing/reappearing characters – is that our lives and our memories function in much the same way: we have crystallized memories that appear ‘out of time’ but that feel full and colourful, and then there are long blanks of no connection or seeming non-event. What we recollect – the sensational, the exceptional *and* the utterly banal – stays with us for reasons unclear (to me), but stays with us all the same in these sharp moments so beautifully and expertly captured by Egan. I have nothing but praise for this incredible novel that so beautifully weaves characters together. I loved the questions it raises about what we decide to make of our lives, how we go about making decisions, overcoming grief, regret and our own impetus for self-destruction, how we decide to create *anything* in a world so bent toward massification, how we believe in the possibility of unique individuality in an era that simultaneously promises and scorns such a chance. It is a beautiful novel full of reasonable hope that we might do well with the little, parcelled time we have and that we might impress our lives and our singularity on those around us. I realize I’ve made it sound overly optimistic or some kind of “audacity of hope” sort of thing. It’s not that. It doesn’t ignore or gloss the failures, the inadequacies, the regrets, but it also doesn’t *dwell* in these spaces, or declare these states to be the de facto position for humanity. It asks whether we might do something different (if not something more) with the little time we’re allotted.